Prepare the bechamel sauce: Heat the butter until melted. Add the flour and stir until smooth. Add the milk and cook for about 10 minutes. Peel and cook the asparagus for approximately 8-10 minutes. Cut them in pieces and put them into a baking dish. Put the asparagus spears beside. Cut the onion and saute about 2 minutes. Add the parsley and raw ham (cut in pieces) and saute 3 more minutes. Peel the potatoes and slice them. Blanch them for about 4-5 minutes. Add the potatoes and raw ham to the asparagus and mix well. Mix the sour cream with the bechamel sauce and pour it over the gratin. 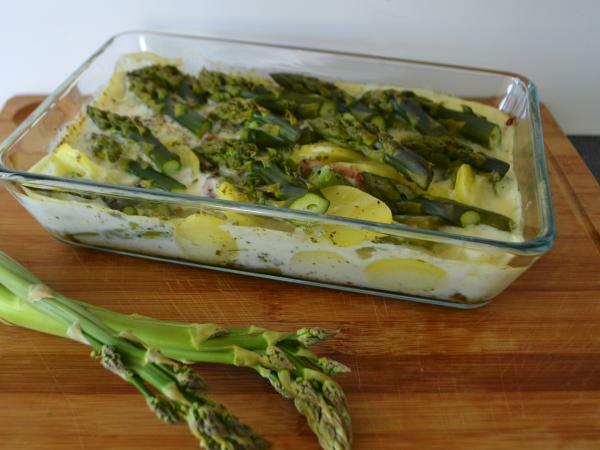 Finish the gratin by covering the mixture by the asparagus spears. Before baking, cover the gratin with aluminium foil. Take it off after 20 minutes of baking in the oven (200°C) and finish cooking for 20 more minutes.